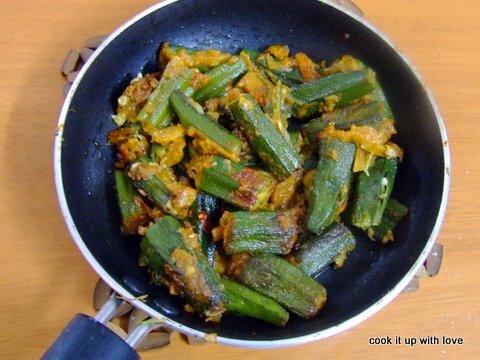 Made out of tender Okra (Bhindi), this side dish is really yummy and goes well with roti and rice. Chop the Okra into 2 inch pieces, and make a neat slit in one side of each piece. Set Aside. Now make a batter out of gram flour, salt, curd, red chilly powder, garam masala, amchur powder and water. The batter should be of paste like consistency. Now with the aid of a butter spreader, fill the slitted okra with this batter. Steam the stuffed okra for around 4 to 5 minutes. Now in a pan, heat butter, and saute some jeera seeds in it. Place the steamed and stuffed okra in the pan and fry for a while. If the batter is left out, it can be added to this for additional flavour. Top with some coriander leaves, and serve hot. This entry was posted in Side Dishes . Bookmark the permalink.